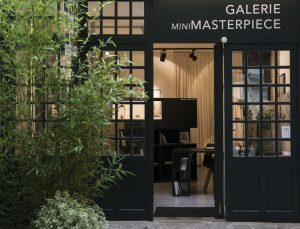 Esther de Beauce’s lair Galerie MiniMasterpiece, is well hidden in a private courtyard of St-Germain-des-Pres. In this elegant and welcoming setting, she gathers astonishing works by renown French and international artists and designers she collaborates with from conception to end product. a mentor and a muse. She defines art jewelry as wearable sculpture - an ubiquitous term but true to its roots in this galerie. The artists are not jewellers. Confronted to the challenges of working on a small scale and create a wearable piece, they are forced to adjust their ways and get out of their comfort zone. The current exhibit “Le cou et les oreilles” surprises by the combination of styles - Francois Azambourg’s hammered brass wire and Jonas Moenne’s porcelaine and precious stones. The former is mechanical and Calderesque, the latter is poetic and fragile. Both share a mastery of their medium, and a palpable desire to share their passion. Images courtesy of galerie miniMasterpiece. Carrying on meandering in Paris, you will certainly come across Elsa Vanier’s galerie near the Odeon and Jardin du Luxembourg. Elsa left the world of finance to dedicate herself to contemporary jewelry - she is passionate and fiercely protective of her artists, showing them off in her clean lines space. The galerie is currently transformed into a giant kaleidoscope, showcasing the work of 8 exceptional artists. The Splash ring of Luisa Bruni has my vote. If you find yourself in London, take the time to visit Gill Wing Jewellery in Islington. A charming space with a private garden; you will step off the madness of the high street into a havre de paix. The jewelry is accessible, poetic and full of the love and pride the team put in their work. “Made by Hand, Shown by Makers” is their motto. They constantly invite artists to share their shelf space, creating a vibrant and inclusive community of jewelry lovers. A delight. Of course, you cannot be in London without visiting Louisa Guinness in Mayfair. Louisa believes in the power of jewelry not only as a body adornment but also as an objet to show off in your home. And why not? She commissions pieces from sculptors, painters, ceramiscists…. collects unique pieces from various periods by master artists and mixes it all in her architectural showroom accessible by appointment only. There is nothing like pinning a Calder brooch to your lapel (and the heart break to return it to its case) - and I did fancy these earrings by Ron Arad. In Brussels go to Les Precieuses (exquisite), in Venice don’t miss OHmyblue and share a laugh with Elena and Chiaralice, and in Lisbon the incontournable galery Reverso . Close to home you have to visit Noel Guyomarc’h the master gallerist of Canada.